Skill Level 4. For experienced modelers. This model builds into a 1:144 scale replica of the N-1 3L in the markings of its first launch in February 1969. My thanks to Alex Shliadinsky for his excellent drawings which greatly assisted me in its design. With its display base, the complete rocket stands almost 30 inches tall. To keep the file sizes manageable, I have released it in two separate kits, each with its own instruction document. Begin construction with the first stage kit. You will need a colour printer capable of handling card or cover stock to print the parts sheets. 67 lb cover stock (approx 8.5 thousandths of an inch or 0.2 mm thick) is recommended. Update: A second set of parts files is now available, enlarged to 1:96 scale (almost 45 inches tall). These sheets are roughly 13 inches by 18 inches, and will require a large-format printer. Thanks to Olaf Deen for making this available! Click here to see photos of the finished model. n1_inst1.pdf - 374 KiB - This document contains the instructions only (5 pages). n1_part1.pdf - 5.97 MiB - This document contains the model parts for the 1:144 scale model (9 pages). n1_part1_96.pdf - 5.32 MiB - This document contains the model parts for the 1:96 scale model (9 pages, requires a large-format printer). n1_inst2.pdf - 286 KiB - This document contains the instructions only (6 pages). n1_part2.pdf - 3.89 MiB - This document contains the model parts for the 1:144 scale model (6 pages). n1_part2_96.pdf - 3.96 MiB - This document contains the model parts for the 1:96 scale model (6 pages, requires a large-format printer). The parts and instructions are in Adobe PDF format. You'll need a PDF reader such as Adobe's Acrobat Reader or Foxit Reader to open and print the files. If you want to offer these models on your site, please read this first. In July 1969 the first human set foot on the lunar surface, and the United States had won the moon race. Few people at the time realized how narrow was the margin of victory. Despite tremendous difficulties, the Soviet Union came remarkably close to launching a cosmonaut to the moon using a heavy booster known as the N-1. For decades this rocket remained shrouded in secrecy, and only in recent years has information about the project been revealed to the rest of the world. The N-1 story, though ultimately one of failure, provides a fascinating look at what might have been. In spite of a late start and underfunding, the Soviets came near to having a successful heavy-lift booster which might have led to the first moon landings, a permanent moon base and even manned interplanetary missions. Look at all those engines! A bottom view of the N-1. Lift off! An N-1 night launch. Soviet, Russian and Ukrainian space models - Designer Leo Cherkashyn has a great variety of spacecraft models from the Soviet and post-Soviet eras. Classic Paper Space Models - Designer Lars Folmann has card models of the Soviet R-7 and Proton boosters with a variety of payloads (temporarily hosted at the Ninfinger.org site). N-1: Top Secret - An article appearing in "Wings of the Motherland" Nos. 9-11 in 1993. 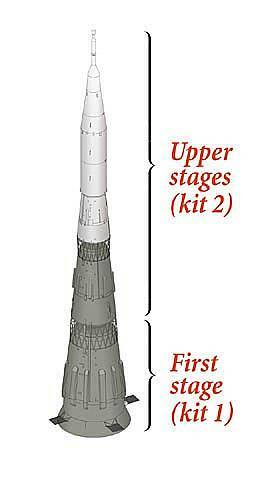 Although in Russian, it includes photos and Alex Shliadinsky's detailed drawings of the rocket. The N-1 Story - From Mark Wade's amazing Encyclopedia Astronautica site, a detailed history of the development of the N-1. N-1 Photo Clearinghouse - Greg Bondar has collected a huge assortment of N-1 photos from around the 'net. Soviet Manned Lunar Program - Karl Dodenhoff's site covers the N-1, the LK lunar lander, and other aspects of the Soviet lunar program.